The following table displays details about the undergraduates who received their Bachelor's degrees and various awards today. The John F. Flagg Award is an annual prize awarded to a graduating senior, majoring in Physics or in Physics and Astronomy, with the highest grade-point average as an undergraduate. The Fulbright Award is an annual prize awarded to the student who, by his or her performance in the Advanced Laboratory, manifests the greatest promise for developing into an experimental physicist in the tradition exemplified by Prof. Harry W. Fulbright. The Stoddard Prize is an annual prize awarded for the best senior thesis by a graduating senior in the Department of Physics and Astronomy. 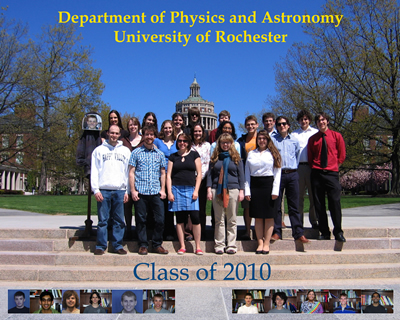 The Undergraduate Teaching Award is an annual award given by the Department to honor the best undergraduate teaching interns of the class of 2010. Take 5 Scholars is an award of an additional semester or year at the University, tuition-free, to explore in great depth a subject apart from one's major or main theme of study. The Kaufmann's Entrepreneurial Year (KEY) is an award of an additional year at the University, tuition-free, to transform an idea into an enterprise that positively affects others. The Barry M. Goldwater Scholarship is a nationally competitive scholarship in science, math, and engineering, endowed by the U.S. Congress to honor the late Sen. Barry M. Goldwater. Founded in January 1, 1925, the German Academic Exchange Service: Research Internship in Science and Engineering (RISE) Scholarship provides students with research opportunities at top institutions across Germany. Phi Beta Kappa is the oldest and largest undergraduate honor society in the US dedicated to fostering and recognizing excellence in the liberal arts and sciences. Sigma Pi Sigma is the national physics honor society, affiliated with the American Institute of Physics. Sigma Pi Sigma exists to honor outstanding scholarship in physics; to encourage interest in physics among students at all levels; to promote an attitude of service of its members towards their fellow students, colleagues, and the public; to provide a fellowship of persons who have excelled in physics. The Graduate Teaching Award, won by Shane P. Fogerty, is an annual prize awarded by the Department to the best graduate teaching assistant. The American Association of Physics Teachers Award, won by Bethany J. Little and Fred E. Moolekamp, is an annual prize awarded by the Department for excellent performance as a workshop, recitation, or laboratory instructor. The Susumu Okubo Prize, won by Seyed Mohammad Hashemi Rafsanjani, is a prize in honor Prof. Susumu Okubo, awarded annually by the Department for excellent performance in graduate course work and on the Preliminary Exam. The Frederick Lobkowicz Prize, won by Fan Yang, is an annual prize awarded by the Department in recognition of an exception PhD dissertation in high-energy nuclear or particle physics. This year's Award for Excellence in Undergraduate Teaching went to Andrew N. Jordan, Professor of Physics, and Alice C. Quillen, Professor of Physics and Astronomy. The Professor of the Year Award in the Natural Sciences went to Steven L. Manly, Professor of Physics . The 2010 Ives Medal of the Optical Society of America went to Joseph H. Eberly, Andrew Carnegie Professor of Physics and Professor of Optics. The 2010 G. G. Stokes Award of the International Society for Optical Engineering went to Emil Wolf, Wilson Professor of Optical Physics and Theoretical Physics. The NSF Young Investigator Award went to Andrew N. Jordan, Professor of Physics. The 2010 J. J. Sakurai Prize for Theoretical Particle Physics went to C. Richard Hagen, Professor of Physics.